Love mushrooms but can't quite cook them to perfection? Learn what mistakes to avoid when cooking mushrooms to get the most out of your flavorful fungi. Mushrooms are a fantastic way to add a savory nuance to your favorite chicken dinners. They’re quick and easy to cook and bring so much flavor to a dish. But you may be surprised to find out there’s a knack to cooking mushrooms. Thankfully, learning the ins and outs of cooking these humble fungi couldn’t be simpler. Whether you’ve picked up an assortment of wild mushrooms from your local farmers market or grabbed a container from the supermarket, odds are your fresh fungi will have bits of dirt clinging to their caps. Of course, you’ll want to remove the dirt, but don’t wash them. Mushrooms are mini sponges that soak up every bit of liquid they come into contact with. What to do instead? Brush the dirt off with a damp paper towel. You can also pick up a mushroom brush, which is specially designed to remove dirt without damaging the cap. If you’ve ever sautéed mushrooms, you’ll know that they give off a lot of water in the pan. To avoid sad, wet mushrooms, crank up the heat to allow this water to evaporate. It may take a few minutes, but be patient—the results are worth it. We’ve covered mushrooms’ sponge-like qualities, so you won’t be surprised to learn that they’ll quickly soak up oil or butter as well. 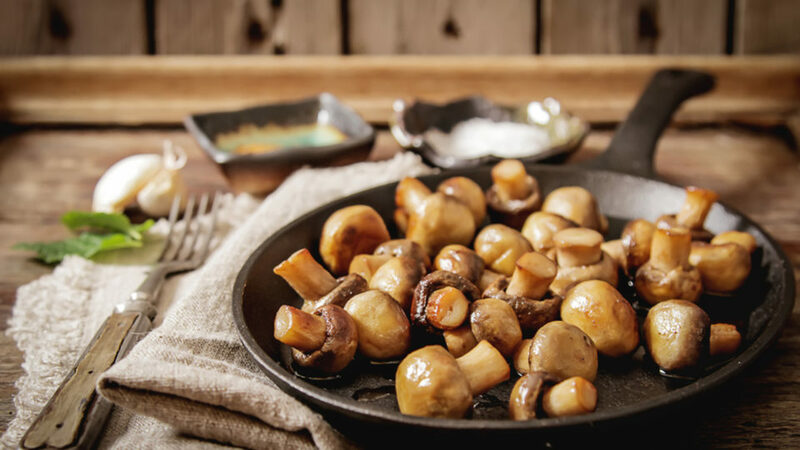 Don’t be afraid to give your mushrooms a generous dose of cooking fats and add more as needed. This gives them a lovely brown color no one can resist and infuses them with extra flavor—ideal if you’re whipping up a mushroom-based sauce. Too many mushrooms in your pan means they’ll steam, not sauté. Be sure you’re using a large enough pan and don’t pack them in. For instance, if I’m adding mushrooms to a bolognese, I always cook my ‘shrooms separately from my other veggies to allow all that water to evaporate. These fabulous fungi need space to breathe. Ready to master the mushroom? Try one of our top recipes for mushroom lovers. Article by Camille Berry for Taste of Home. View the original article here.